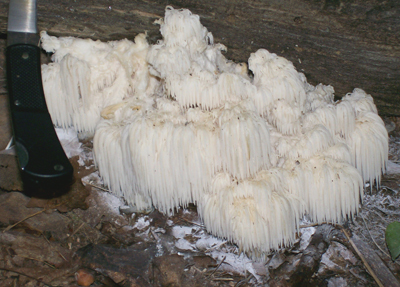 Here's another of the Hericium's that shout their existence by usually being on a dark background. 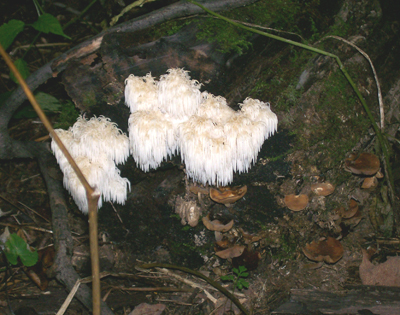 These are similar to Hericium coralloides however the spines here are much longer and definitely droop straight down. There is nothing quite like walking through the woods and coming upon something as starkly visible as the Hericiums. You do not have to stealthily sneak up and find these babies like you have to with Morels, Black Trumpets, Horn of Plenty and Sheephead. 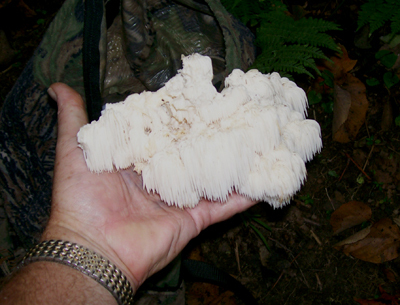 Hericium mushrooms are some of my most favorite. I will put their genus in the top 10, at the upper end. Chunks of these in a homemade mushroom chowder is reminiscent of the texture of bay scallops. When you find these Hericium mushrooms you don't have to review all the fine details about gill color, spacing, latex presence, latex color, changing latex colors, whether the mushroom changes colors/stains when handled, etc. When you see the long spines on these you know you have a safe edible. Plus these are great! Here is one I am holding so you can get an idea of the sizes involved. However, they do get bigger than the one I'm holding. The smaller ones are the younger ones and therefore the fresher ones for eating. By-the-way, the one I am holding is the same one that looks big in the first photo. Everything looks bigger when it's a close-up. My hand provides the size reference. Here is another. This one a bit bigger. As big as it appears above here is the same one being held. Hericiums, unlike the vast majority of mushrooms, like to grow high up in trees. You will often find them 10 to 20 or more feet up on an old beech tree wound or dead standing tree. Here is a devilishly nice one 18 feet up an old snag. 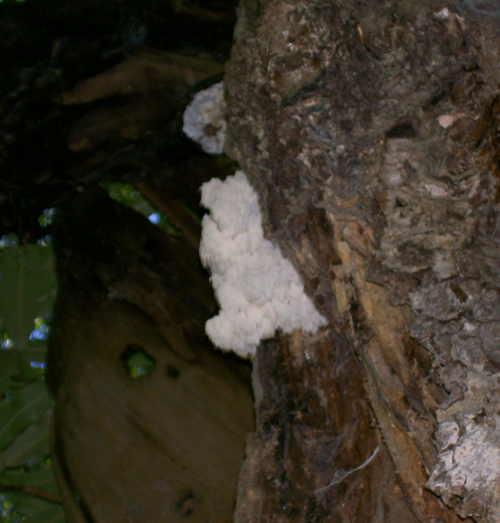 Read about how I recover these high Hericium's on a regular basis. 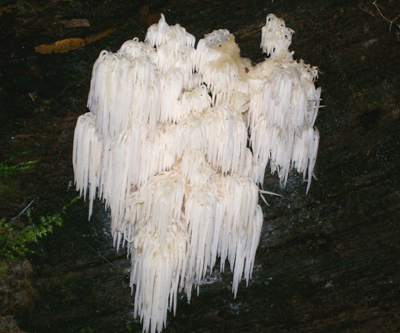 There is also another long toothed Hericium ( H. erinaceus ) that has one main body with straight down hanging teeth and looks very similar. The difference between them and these is that these have several branches that terminate at the ends where the teeth droop. In the second photo above, where I am holding one, there are at least 7 or 8 separate parts. These mushrooms grow on live deciduous trees ( preferably beech - as a parasite) and old downed trees and branches ( as a saprophyte). White when fresh slowly turning yellowish/brown upon aging. As visually blatant as these fine mushrooms are you will walk by them and not see them. I kid you not! Here are two growing under the cut portion of a tree trunk. I walked up a logging road for a mile and a half carefully observing 350 degrees around me on the way, however on the return trip back to my car I spotted them. Even with these, just like Morels, you need eyes on the back of your head. 35 years of picking wild mushrooms and even though I know to turn around and look behind, I still miss some mushrooms on occasion. Good thing I came out the same way I went in. Best practice is to cut off the cluster, cleanly, as close to the host tree as you can to keep all the parts together and so as not to damage the rooting base. 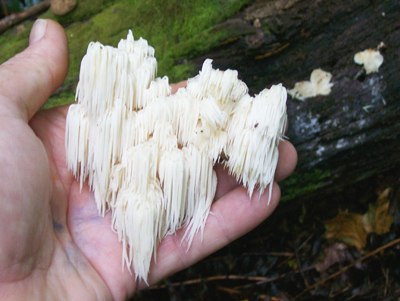 Hericium americanum - A/K/A - Bear's Head Tooth. DATE - September 24, 2009. FOUND - Linn Run State Park - near Ligonier, Pennsylvania. growing on the cut end of a downed and unidentifiable tree. All I could tell was it was deciduous. Weather conditions: Wet - all day drizzle. The two weeks prior to finding these our area was more on the dry side.